SAN JOSE – The Monarchs Women’s Basketball Team from Archbishop Mitty High School starts each practice like any other team. They stretch, run drills, shoot a few shots. The team is led by Coach Sue Phillips, who also coached the U-17 USA basketball team last summer. But one of its biggest weapons isn't on the practice court. It's in a small room next to the gym where Phillips and the players watch game film differently than years past. “(Before) I would spend countless hours editing each clip from a turnover to an offensive rebound and it would add a good eight hours a week,” Coach Phillips said. Now, Krossover does the work for her. It’s a company that breaks down game footage for teams around the country. 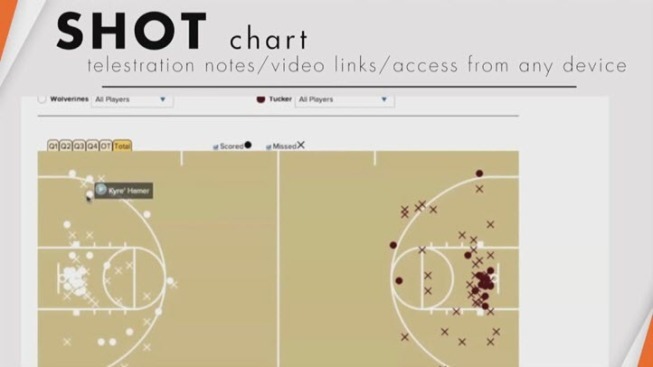 Coaches send video of their games to the company and within a day or two, they get a complete analysis. The night Phillips allowed NBC Bay Area into the room, she was showing all of the Monarch’s turnovers from the previous game. Krossover also provides player stats by game, half, even quarter. Phillips can also see the same stats for the opponent. It even shows where the Monarchs made and missed shots, so before they start practicing they know what they need to work on. "I get to look at not only the mistakes I make but things I can look at to grow upon,” said Senior Forward Taylor Todd. More Bay Area high schools are starting to use this technology like some of the top professional and college teams. About 30 teams in the Bay Area use it now, up from five teams two years ago. "You can actually just click on a make or miss and you can filter it by player,” Phillips said. “All the other shots disappear with the exception of that player. When you click on that shot it provides a 5-7 clip of how that shot was made or missed." Coach Phillips says it’s also easier to provide highlight clips to college coaches recruiting her players. "For many of these kids who get recruited by colleges, I simply just have to click and send a link to that game footage on their server." It costs about $1200 per team per season. Phillips says it’s paid off. The Monarchs are the 17th ranked team in the country and shooting for their 11th Nor-Cal Championship.